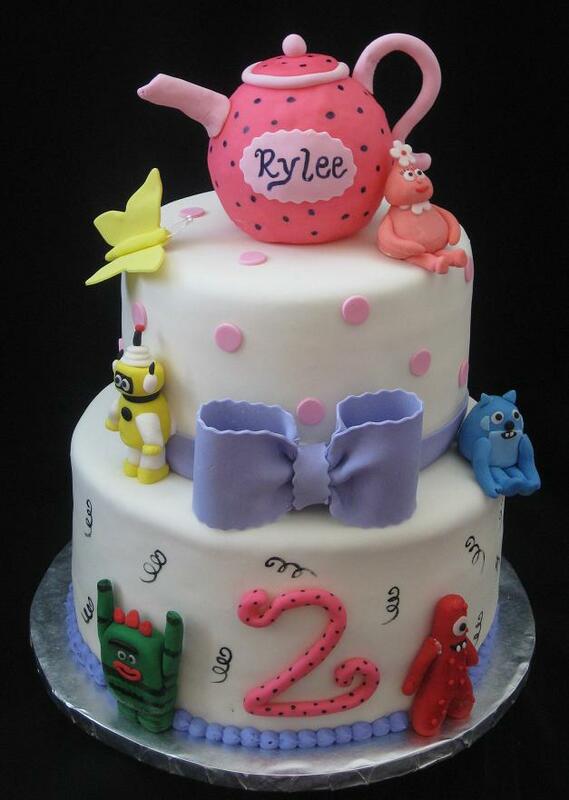 ”Hello Stephanie, Rylee's birthday cake theme of the Yo Gabba Gabba cake was ABSOLUTELY GORGEOUS! Everyone loved it! Her cake was more beautiful than I expected and tasted great! I would recommend Piece-A-Cake to anyone. Thank you so much for helping to make her 2nd birthday a special one!” Ebony K. – Fayetteville, NC. Birthday cake theme pictures from Piece A Cake in Raleigh, North Carolina makes incredible and deliciously edible theme cakes for any occasion. Here's a good example of matching the birthday cake to the birthday invitation and theme. 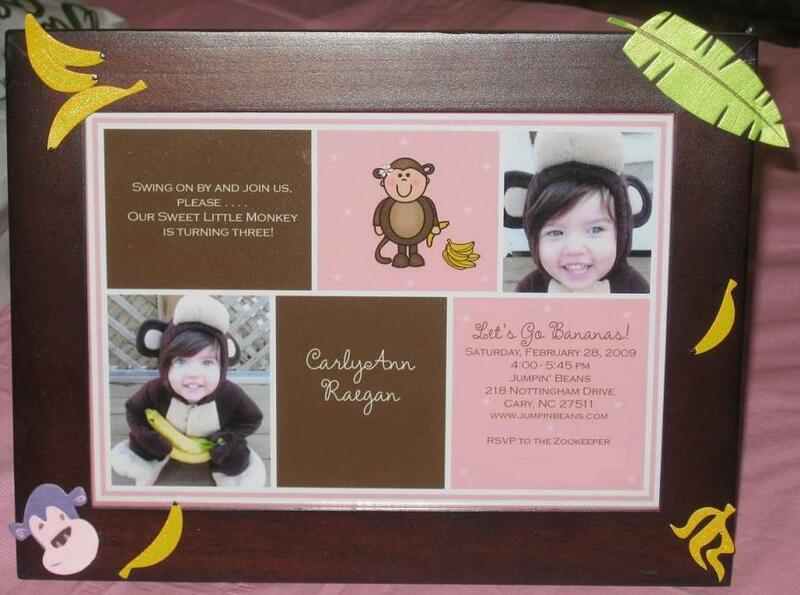 Kim from Raleigh ordered this monkey birthday cake theme for her daughter’s 3rd birthday cake. She wanted to match the birthday cake to the birthday invitation and theme. The cake flavors were vanilla and banana. 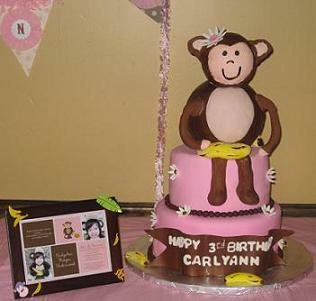 The monkey was shaped Styrofoam covered with fondant; something that she can save for a long while. Except for one leg that grandpa ate! 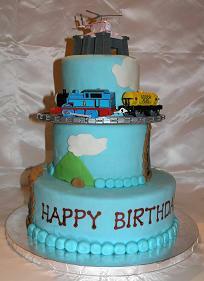 Susan of Raleigh ordered this Thomas the Tank Engine cake. She held the party at Chuck E Cheese with the Thomas Engine birthday cake theme. The Thomas the tank engine cake had a working Thomas train with track around the cake and lots of track left overs! Flavors for this Thomas the tank engine cake were red velvet with cream cheese icing covered and decorated with our hand made marshmallow fondant. Enjoy the video and see Thomas go round! This Thomas Engine cake theme is a 3-tiered chocolate, vanilla, and butter flavored cake covered with marshmallow fondant and decorated with the Thomas Engine theme. It is a working train cake and lots of leftover track for fun after the birthday party! 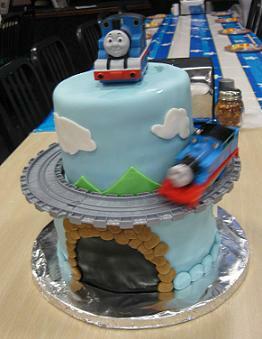 The Thomas Engine birthday cake theme is topped with Harold the helocoptor. E-mail Steph about your birthday cake theme idea. 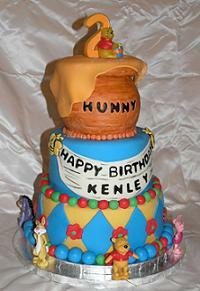 This Winnie the Pooh birthday cake theme was made for Kenley, a beautiful little girl celebrating her 2nd birthday. Click here to watch Steph make this cake! I must say we had lots of fun making this unique birthday cake. Sometimes you just want to keep one, but we had to let this one go. Best of luck Kenley and we will try to top this next year! This pirate cake was a birthday cake theme for twins. 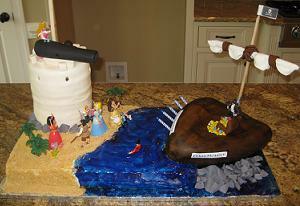 Sophia wanted a pirates vs. princesses theme cake and the fun was on! The pirates were seen stealing shoes so the princesses brought out the big gun! Watch the pirate cake video for an exciting scene. Only the birthday twins know how it ended. The pirate cake was marble, chocolate, and yellow with butter cream and raspberry filling. Except for the figures and the pirate ship’s mast everything was edible, even the flags! 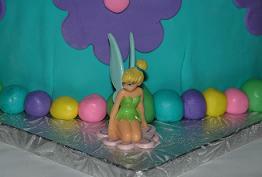 This Tinkerbell birthday cake theme was ordered by Kim, a loving and caring grandmother. 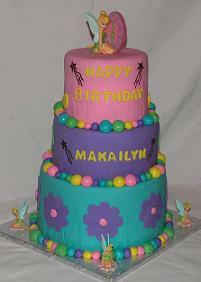 The beautiful Makailyn was celebrating her 1st birthday and the Tinkerbell cake was just for her. Her nickname is “Tink” so there you have the perfect theme cake. The cake flavor was chocolate, butter, and vanilla all with butter cream icing covered with our special marshmallow fondant. 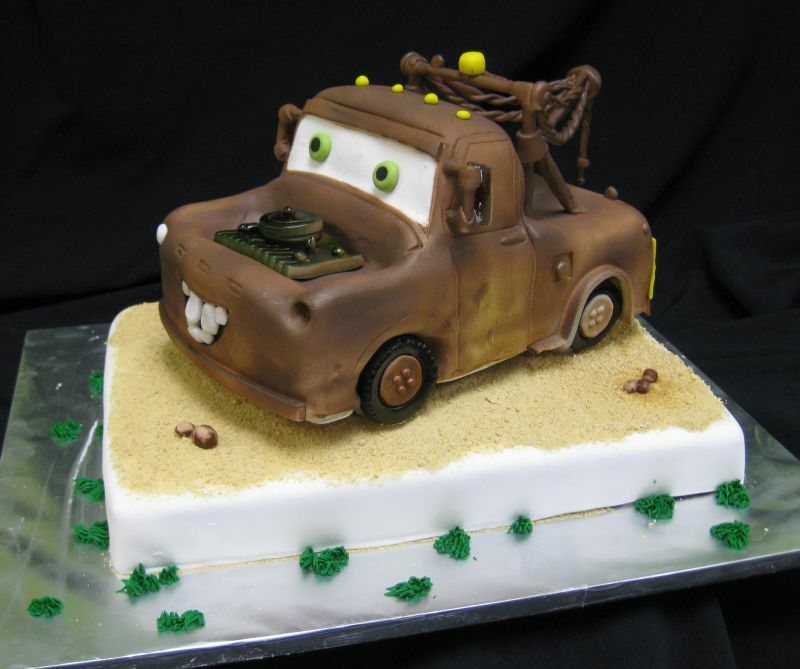 Fondant has a bad wrap because most cakes are made using the factory fondant with all of the preservatives to be shipped, stored, frozen, thawed, applied, then re-frozen and thawed again before delivery. 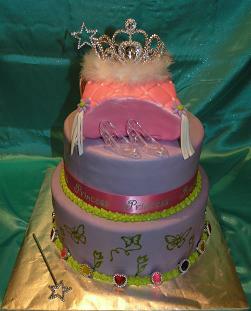 Many of the high volume cake bakeries use fondant just for looks. Your cake is usually stored in a fridge for several days before it’s due. This is why you taste the refrigerator in some cakes and fondant. We bake and decorate the day before it’s due! It’s a little nerve racking sometimes and when things go wrong we may have to stay up all night with a re-do, but it’s worth the risk if you want a great tasting fresh cake! Piece A Cake fondant is made fresh to order. It’s never frozen and is applied to the cake the same day it is made. 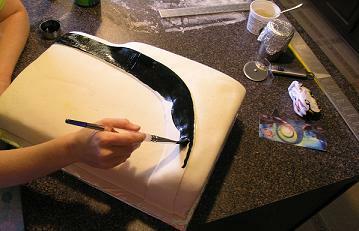 We make and apply the fondant the day before your cake is due. This process guaranties your cake is fresh and tasty! Another reason our fondant taste great is the secret ingredient in our recipe! Well, it’s not secret; we share the recipe to all of our clients so they know exactly what they are getting. Our secret ingredient is love. 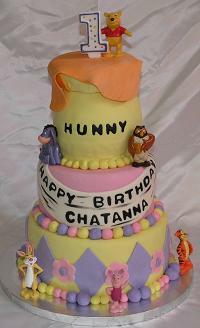 This Winnie the Pooh birthday cake theme was ordered by Joyce, a loving grandmother for her granddaughter who was celebrating her 1st birthday. She wanted the original Piece-A-Cake Winnie, but changed the colors to pink, light yellow, and lavender to match the color scheme of the party. The cake flavor was vanilla with butter cream icing covered in delicious marshmallow fondant. The birthday cakes are so much more than just a cake. It should reflect the person celebrating their birthday. Sometimes more work goes into designing the cake than in making the birthday party cake itself! 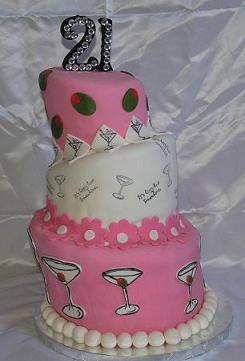 This martini theme cake was for a special young lady named Jessica. 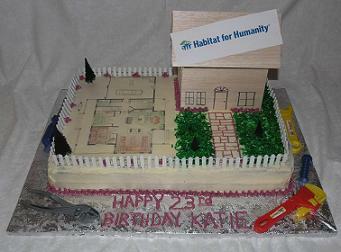 She was turning 21 and wanted a special 21st birthday cake to celebrate this occasion. She decided to go with a martini cake! 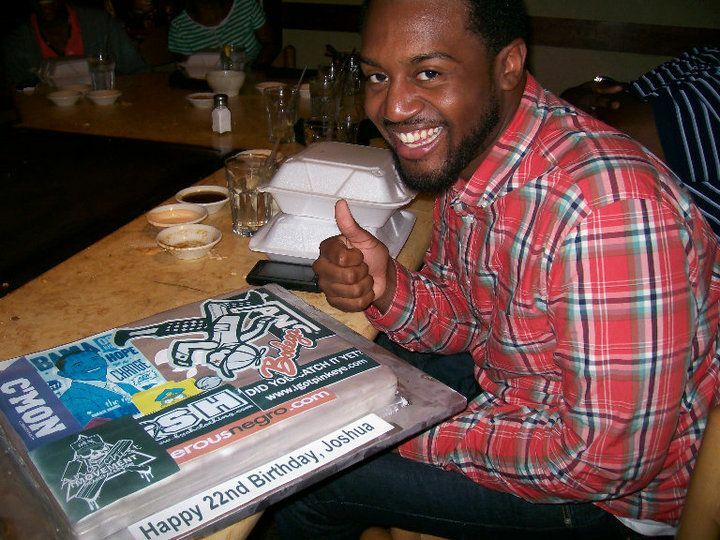 More about this 21st birthday cake! This zebra birthday theme cake was ordered by Mrs. Smith for her lovely daughter to celebrate her 18th birthday and ready for college! Getting prepared for college, she had picked out her dorm room décor. Her Mom sent the picture for Steph to match the look and feel of the room décor. 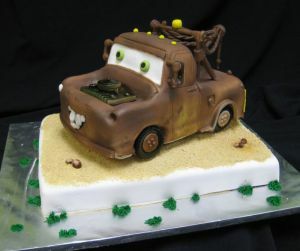 What a great unique cake idea! We made the stripes out of colored rolled fondant. 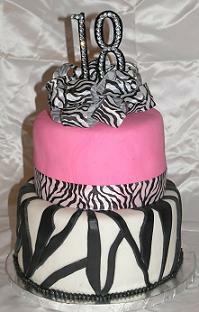 Combining the pink top and ribbons with the wild stripes made for a very unique cake. 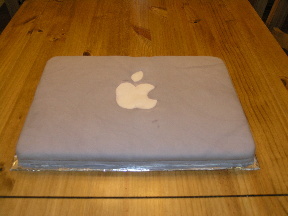 The lap top computer cake flavor was vanilla with butter cream icing covered and decorated with our hand made marshmallow fondant. The stickers were edible! This is the MAC daddy! A loving wife wanted to get her husband a computer theme cake. He worked with Mac computers so it was a piece a cake! This Cinderella birthday cake theme was made for a beautiful little girl named Emily, who was celebrating her 5th birthday. The Cinderella cake is vanilla with butter cream icing covered in marshmallow fondant. The tiara was a treat for Emily, not only was it a cake topper but something that she could wear. The rings around the bottom of the cake were party favors for all little princess’s that came to her party! 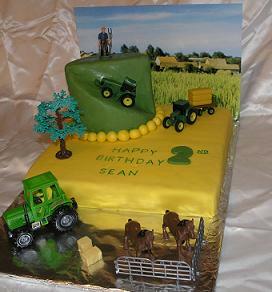 This John Deer theme cake was made for Sean to celebrate his 2nd birthday. 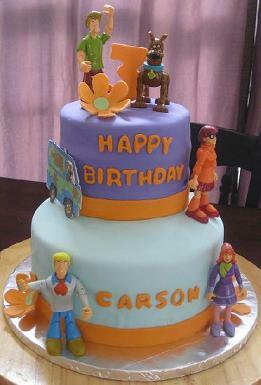 This Scooby doo cake was red velvet with cream cheese and French vanilla with butter cream, yummy! 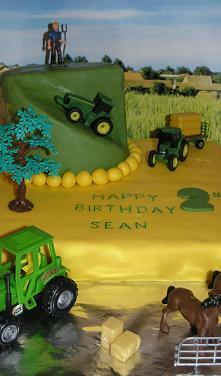 Design a cake to match the birthday theme and they will get a special cake to remember forever. We used our handmade marshmallow fondant to decorate. Keri of Raleigh ordered this Scooby cake to celebrate her daughters 3rd birthday. Her daughter Carson loves Scooby Doo! 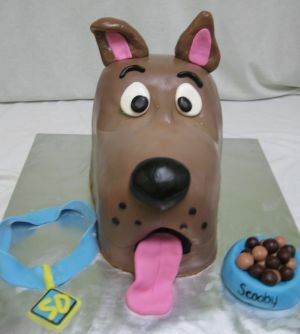 So what better way to celebrate her birthday than with a Scooby birthday cake theme? The birthday cake flavor was white with buttercream icing covered and decorated with hand made marshmallow fondant. See the mystery machine in action in the video below. 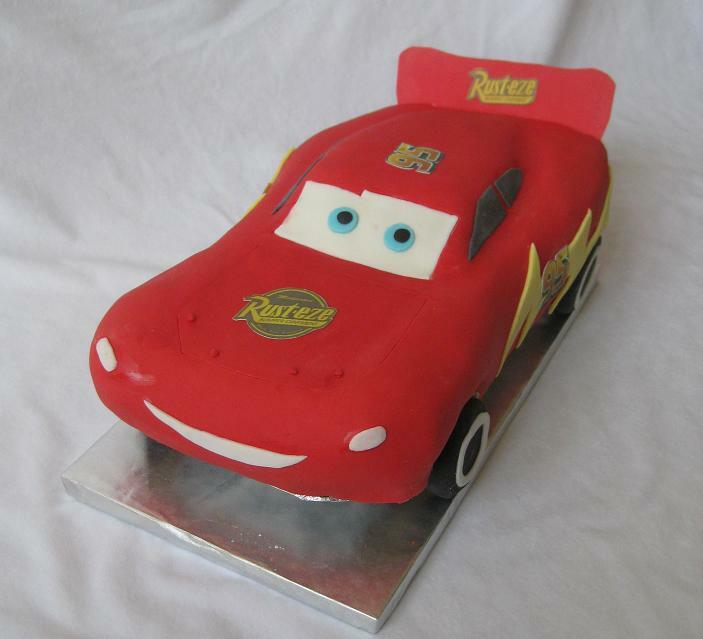 Lisa S. of Lillington ordered these birthday theme cakes for her son Hayden’s birthday. Lisa is a returning customer of ours, thank you Lisa! 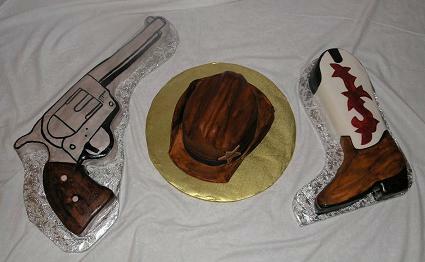 The gun and boot cowboy cakes were vanilla flavor and the cowboy hat cake was yellow flavor. All were covered in Marshmallow fondant and hand painted with edible coloring. 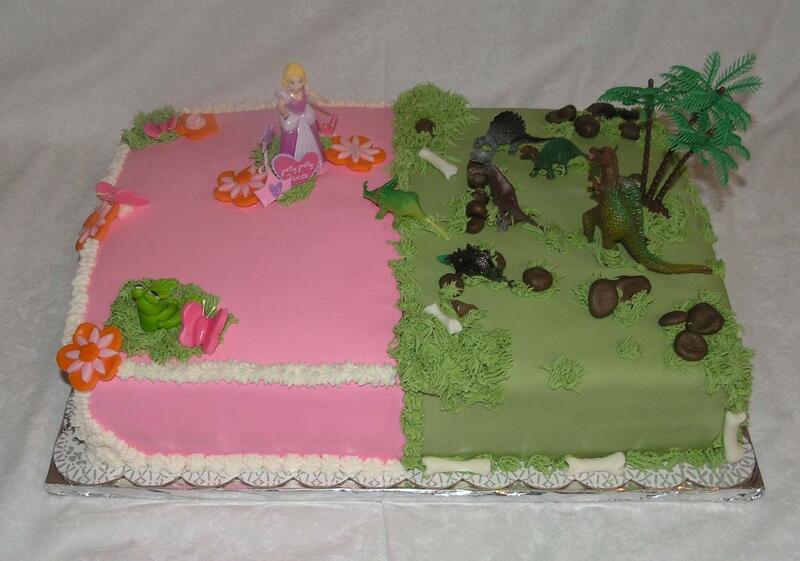 This twin birthday cake was made for Layton and Natalie to celebrate their 4th and 6th birthday together with a dinosaur vs. princess birthday cake theme. The cake was vanilla flavored covered with butter cream frosting with princes and dinosaur figures. 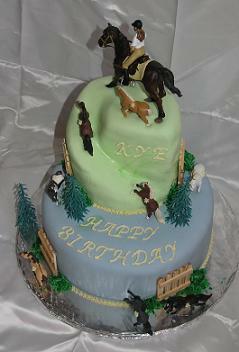 This horse theme cake was made for KYE! Happy birthday! Choose your birthday cake theme and make someone a unique cake...just for them. You can really get creative and build a cake around something they love. What to do with those delicious recipe leftovers? Have fresh cake leftovers for two weeks! If you are looking for some great recipes, I highly recommend this site. Great Food Recipes always start in a Cooks Cozy Kitchen , where Great Cooking Recipes begin, laughter and make-your-tummy-happy food with fantastic Easy Recipes. Dessert Recipes and Appetizer Recipes. 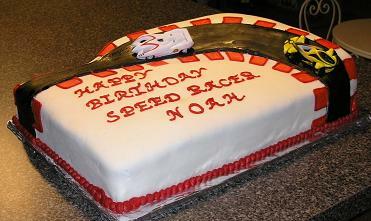 This is a Speed Racer chocolate birthday cake theme covered with fondant and edible paint. See more birthday cake pictures. 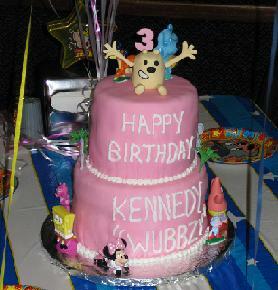 Jeanie from Raleigh ordered this wow wow wubbzy birthday cake for her daughter Kennedy’s 3rd birthday. Kennedy’s nickname is ”Wubbzy” so mom incorporated all of her favorite characters into the wow wow wubbzy cake and of course wubbzy on top! 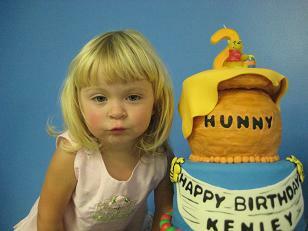 The wubbzy cake topper was made with marshmallow fondant. This wubbzy cake flavors were chocolate with chocolate buttercream icing for the bottom tier and the top tier was red velvet with cream cheese icing, yummy! 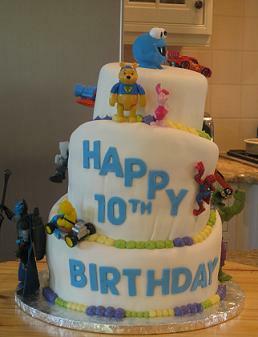 Tameka of Greensboro ordered this topsy turvey birthday cake theme for her son’s 10th birthday. She wanted to celebrate it by combining all of his favorite characters throughout his childhood. She bought all figurines, mailed them to me and I applied them to the finished cake. All 3 tiers were white cake with buttercream icing and covered and decorated with hand made marshmallow fondant. 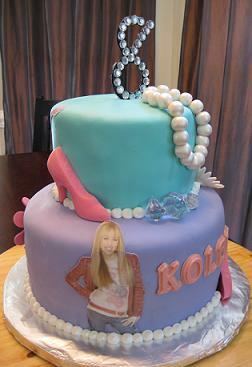 The Hannah Montana Cake ordered by Tise of Raleigh, NC was for her daughter Koley’s 8th birthday. Tise described Koley as “Miss Prissy”. She loves Hannah Montana and is a girly girl who loves dress up and high heels. So we created an all in one birthday cake theme just for her. We have our edible paper of Hannah accents, some candy melt high heel shoes, an edible pearl necklace. We also added a little non-edible bling and girly colors and Koley loved it! When I delivered the cake neither the mother nor the birthday girl were there, just Daddy. So after delivery a few moments down the road I got a call from Koley herself thanking me for her cake and how much she loved it! That was well worth it all, to hear tears of excitement and happiness in that child’s voice. I am so overwhelmed that she took the time to call me and thank me. I can’t wait to do your 9th birthday cake theme. Happy Birthday Koley! 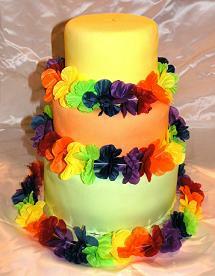 This Hawaiian theme cake was made for Good Hope Baptist Church in Cary to celebrate the summer children’s ministry. The beach theme luau (Party) used bright Hawaiian colors and leis for decoration. Have a idea about a birthday cake theme you would like? E-mail Steph your birthday theme cake idea. Say what? A picture you can eat? Check Out Our Edible Picture Cakes Here. This was a house cake theme for Katie’s 23rd birthday surprise party given by her co-workers at Habitat For Humanity in Chapel Hill. 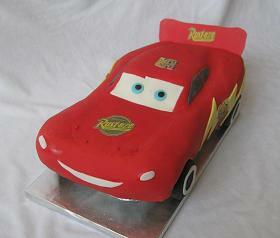 Katie’s wonderful father from Washington was the one who contacted me and ordered the cake. Katie’s job for the Habitat for Humanity is to raise the money for the local projects, but we hear that she can also sling a hammer if needed! The cake flavor was vanilla with hand made buttercream icing. This butterfly cake was made for Ella’s 2nd birthday party. Her loving mother, Katherine from Raleigh, custom ordered it. Her birthday party was a butterfly theme so we did a butterfly themed cake. 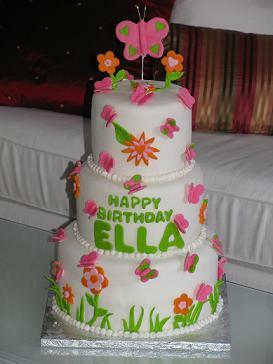 The flavor of cake was vanilla and it was covered with marshmallow fondant sprinkled with hand made fondant butterflies.